Many homeowners just like you have trusted us for their home security solutions. From alarm monitoring to alarm systems to camera systems, trust us to protect your home. Headquartered in Baton Rouge, we have been working throughout Louisiana since 1998, providing the kind of solutions our clients need to feel safe and confident every day. Built to last and withstand the common wear and tear, an Alarm.com powered home security system will be there, keeping you protected when you need it most. Because your system uses a dedicated cellular network, its communication channel is far more secure and reliable. Each system comes with a two-way voice system which will allow you to communicate directly with first responders. Even if your security panel is smashed and your phone line is cut, the system will continue to work. 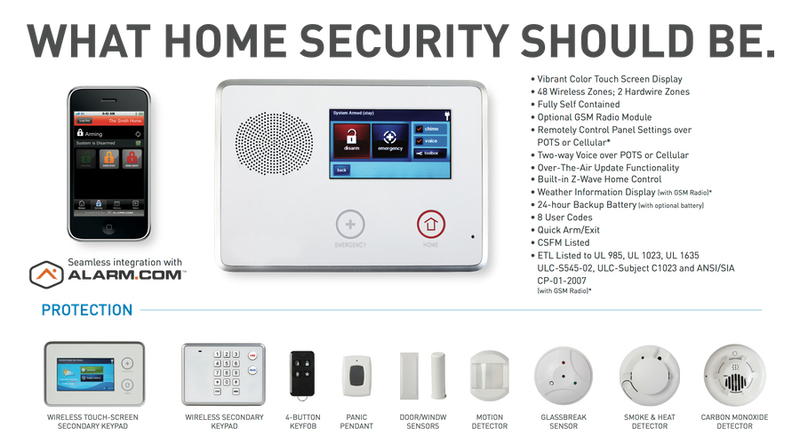 With an intelligent system design, you are able to arm or disarm your system, check in, receive any notifications, and check any connected devices (locks, thermostats, lights, garage door,etc.) from anywhere at any time. With you system you are able to receive notifications in real time by email or text. You can create unique, personalized codes for each person so you can know who’s coming and going. With the system’s “History” feature, you can keep track and review your activity over a certain period of time or even find a specific event. You can control your system from anywhere, at any time, using the Alarm.com mobile app. With one platform, you can see all entry points to your home and have access to managing your door locks and garage doors. If having access to your home’s entry points isn’t enough, our motion sensor package provides instant, high-quality image capture so you can see, on-demand, what is going on in your home. Adding our advanced solutions for video monitoring means you get the best of both worlds and will never miss a thing. With a simple energy management upgrade, your system can learn your patterns and adapt automatically, making your life more convenient and saving you more money. Featuring the latest in modern technology, our 8,000 square-foot alarm monitoring central station is certified by Underwriters Laboratories each year. Our certified operators are ready 24/7 for your home’s alarm pulse signals, in the event of an emergency. With our certified and local experts monitoring for burglary, fire, medical emergencies, or even potentially life-threatening situations, you can rest assured help is just a phone call away.